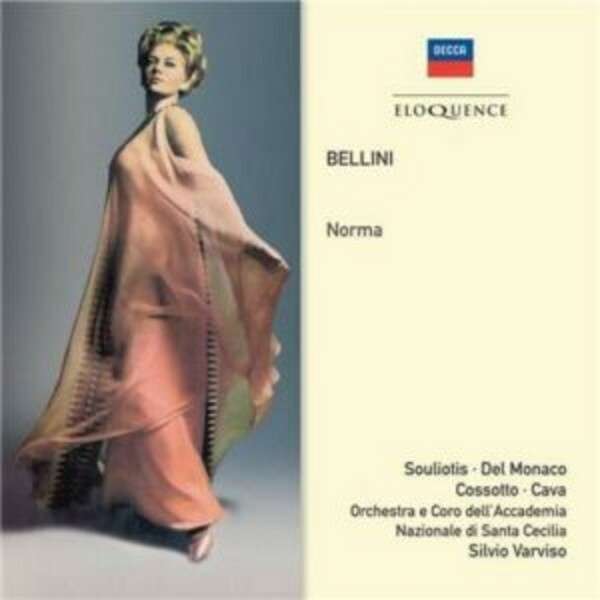 Most of the music for Norma was written between September and November 1831 at Blevio on Lake Como, where Bellini was a guest of the great diva Giuditta Pasta, who created the role of Norma. For more than a decade she was the greatest soprano in Europe and undoubtedly influenced the development of Bellini's vocal style. This recording, made in Rome in 1967, featured the great Greek soprano Elena Souliotis. Silvio Varviso conducts and the emphasis is on the drama and the creation of three-dimensional characters. It's an approach that suited Souliotis. Her interpretation ranges from the ravishing simplicity of her 'Casta Diva' to desperate mood swings in the scene with the sleeping children ('Dormono entrambi') and in her dealings with Pollione. Mario Del Monaco is as strong as ever as the Roman proconsul Pollione, his high notes ringing and unforgettable. Adalgisa is sung by Fiorenza Cossotto (b. 1935), the Italian mezzo-soprano regarded by many as one of the finest mezzos of the twentieth century.